Dianne's last post has got me thinking about how we connect when we have combinations of face-to-face (f2f) and distance students, especially when we have to cope with three scenarios simultaneously. The juggling has to be creative to get all three to work. I thought I'd share with you what we've tried to do in one paper that's part of a secondary graduate initial teacher education qualification. It is a compulsory, full year paper that has to be comparable across three versions - f2f locally, f2f in another city (about a two hour drive away) and entirely virtually, where students are spread throughout the country and are often already working in schools. These people might be teachers from other countries whose ITE quals are not recognised here, and this includes many teachers from the UK who migrate to New Zealand. Another complication is that this paper consists of three diverse modules: Te Puawaitanga, which is about understanding cultural diversity and honouring our treaty partners; literacy across the curriculum, which is examining textual strategies and their links to learning; and PICT - pedagogy and ICT. On the face of it, they have nothing in common, yet they are part of aspects underpinning the New Zealand education system. They help address the Key Competencies in the curriculum and support the professional practices of novice teachers. They also position these pre-service teachers to examine themselves, their contexts and their practices. So that there are synergies across the three modules, the other lecturers and I use Panopto to stream live and record our lectures to our local f2f group. 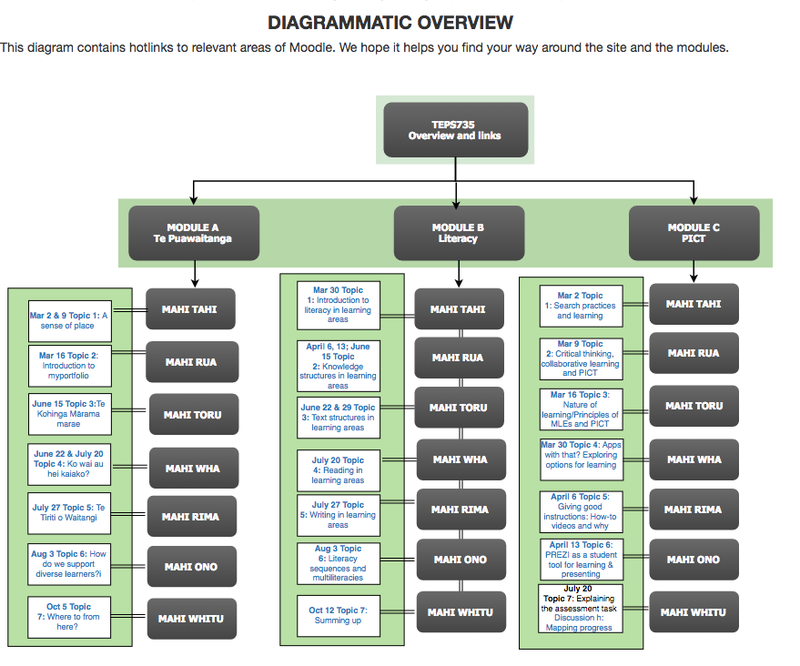 This is accessed through Moodle and all three groups are using the same Moodle site. To provide a mix that acknowledges the three versions (they are labelled HAM, NET, TGA), students are in subgroups for each discussion and all discussions are online in response to whatever is prefaced by the lesson itself. The discussions are also predicated on students having to try something out after the lecture to inform their online posts. I now have quite a large store of how-to screencasts that become useful as a just-in-need arises. As Dianne's post notes, the video posts can personalise and humanise what might otherwise seem distant and cold. One of our colleagues, lisahunter, describes her trials and tribulations of trying to teach online as a new staff member in Digital Smarts. She describes some of the labyrinthine efforts that took place as she found her way. You might enjoy reading her chapter. The book is free! Also as Dianne observes, clarity and presence is something we strive for and constantly seek feedback on how well things are working. To that end, Dianne is leading a partnership with York University on peer mentoring online, where we are paired with someone else to seek a dispassionate point of view about our own puzzles of practice as we teach online. It is a wonderful experience and creates links that might not otherwise exist across space and context. So what are your experiences? 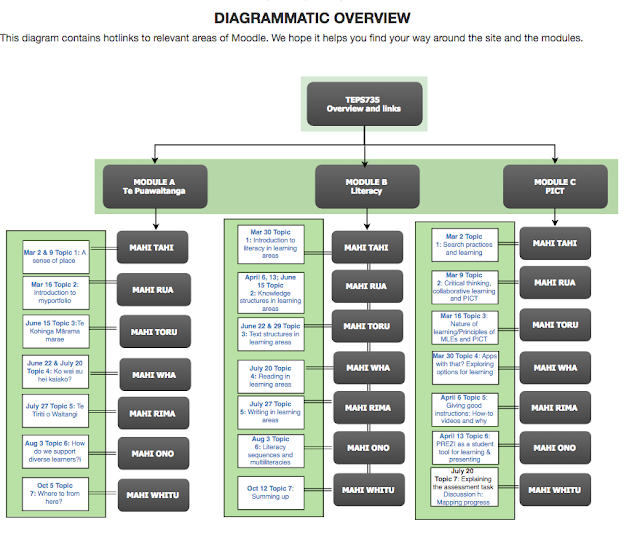 As a lecturer online or as a student learning through such an LMS as Moodle? We'd love to hear from you. I have never really experiences the blended learning with both face to face, and online components. It was good to read a little more about it so that I can understand more about it and where you are coming from. Thinking about my own classroom, it would be good to have work up on a well set out class blog so that if students are away for some reason, they can still interact with the class and what we are learning face to face.